The Koala and River Cruise is a memorable RETURN journey on the Brisbane River to the oldest and largest Koala Sanctuary in the world. This tour includes ENTRY into the Sanctuary and is a must do experience while in Brisbane. The Koala and River Cruise is a memorable journey on the Brisbane River to the oldest and largest Koala Sanctuary in the world. 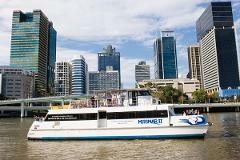 This tour is a ONE WAY cruise including ENTRY into the Sanctuary and is a must do experience while in Brisbane.